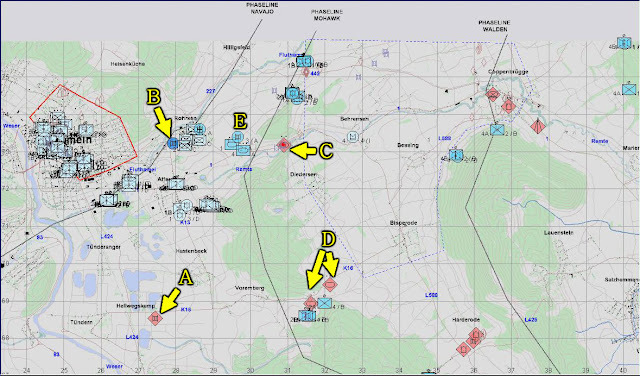 In the end, the enemy was able to reach PL Navajo in numbers enough to mess with the NATO forces in Hameln, who by then were taking a break from a tough fight against the airborne enemy forces. SITREP at 0852. 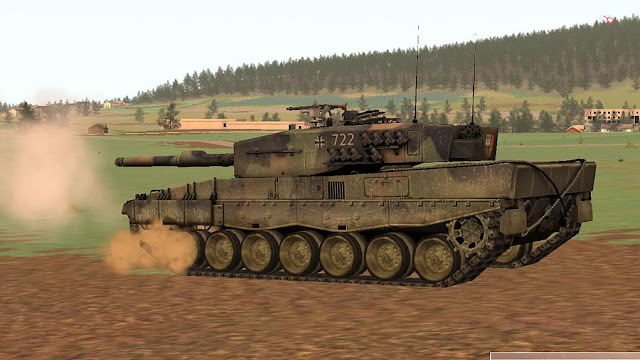 Enemy tanks have broken through PL Mohawk through Voremberg (A, D). The lead element of the Soviet column is ready to pivot north (A). One lonely Leopard has occupied battle position 2 (BP2, B) but it's having trouble acquiring any target. 1st and 4rd Tank Platoons, along with a tank from 3rd Platoon (E) can't react in time to the enemy tank threat south (A and D) and are busy figuring out if the enemy can still cross PL Mohawk (center, C). The reports from OP2 (one kilometer southwest of Coppenbrugge) were ominous: the Soviet tide of tanks had no apparent end. German dismounts at OP2 gauging the enemy tanks advancing west. 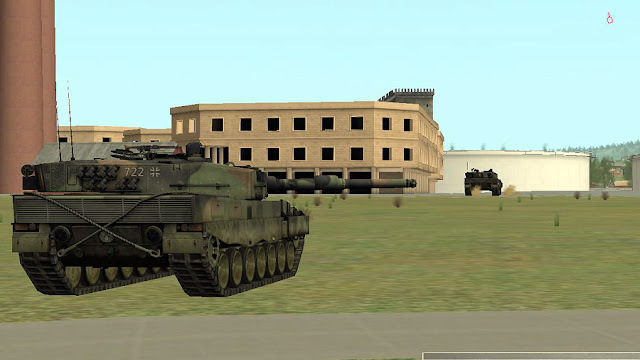 Note the T-72 tank in the background. The only Leopard tank survivor from 2nd Platoon takes position at BP2. The crossings through PL Navajo are near the double smoke stacks in the background (left). On the right (background) the urban sprawl of Hameln. By the time the German commander has decided to commit 1st and 4th Tank Platoons (E in the map above) against the Soviet tanks in the south, it was already too late. The enemy has crossed PL Mohawk (south) with 20+ tanks and there was little point in throwing the last few surviving tanks onto the Soviets. 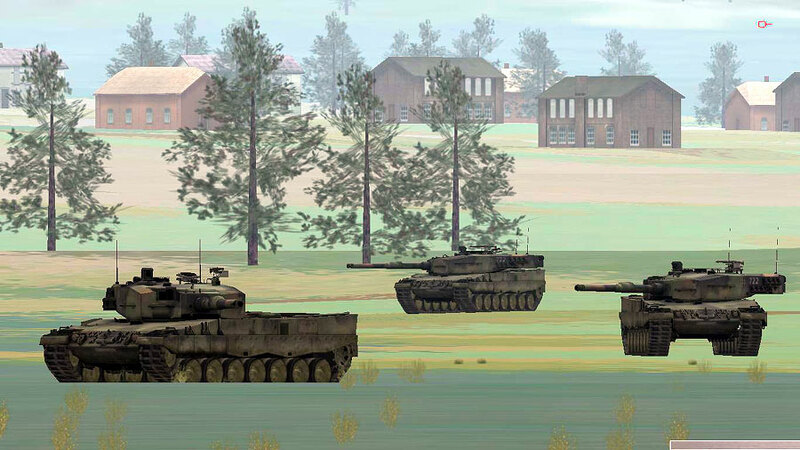 In a hurry, 1st and 4th Tank Platoons are ordered to take positions in BP2. 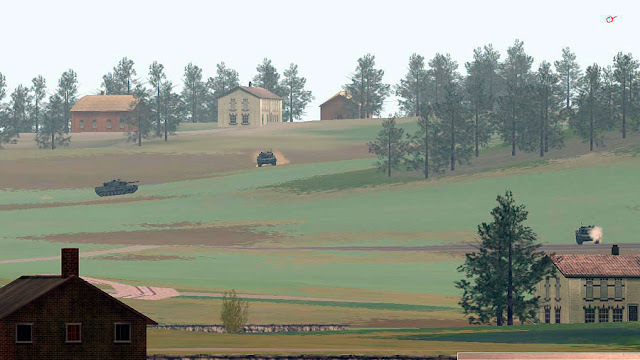 BP2 was a hill topped with a tiny suburb named Rohrsen. The two Leopard tank platoons had issues negotiating the narrow streets and steep slopes in this built up area. By the time the Leopards were going back and forth in the streets, the Soviets were getting ready to cross PL Navajo. Not only the enemy was at the gates, there were few German tanks to fire at them. Tanks belonging to the 1st and 4th Platoon as seen from one of the PL Navajo crossings. The Leopards had no other option but to bug out into the forward slope of BP2 in order to avoid being stranded in the narrow streets of Rohrsen. 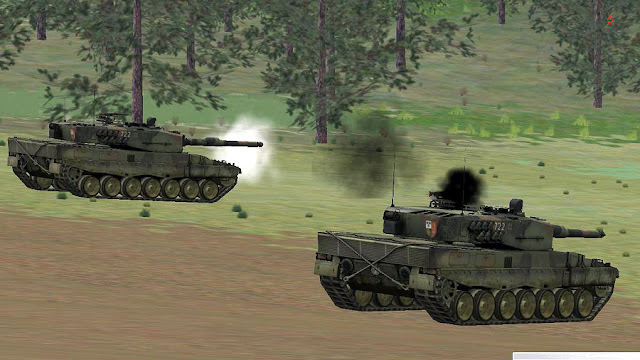 Pictured here, the Leopard tanks trying to find any type of covered fire position. At 0906, the first T-72 cross PL Navajo through one of the bridges across the Fluthamel Canal. This pivotal moment of the battle was not without some heavy fighting, mainly against PzGren. and Marders shooting from the forest in the enemy's right flank (note the destroyed vehicles and tanks in the near background). In the far background, the Soviet onslaught is approaching. 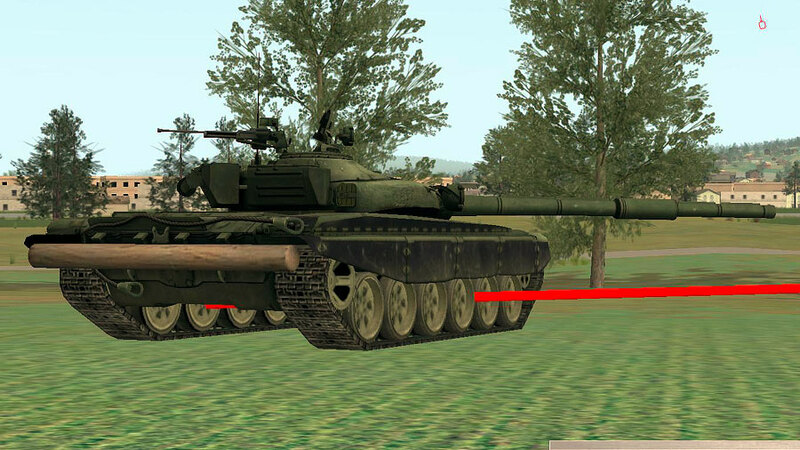 This enemy T-72 was hit by tank fires from BP2. First immobilized and then destroyed. Unable to find a covered position, the Leopards at BP2 get hammered by T-72s crossing PL Navajo. 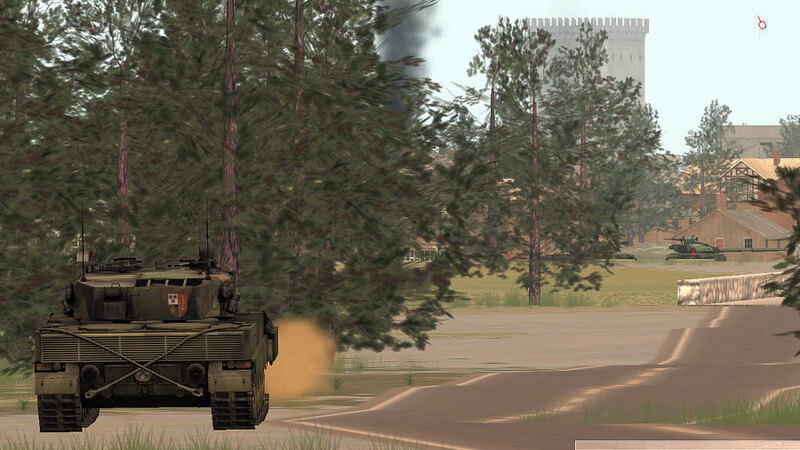 With another tank destroyed, 1st and 4th Platoon completely withdraw from BP2. Only two tanks were left near BP2. The one pictured above took out 3 enemy T-72s. After moving forward from BP2, there was no cover but some minor terrain elevations. This tank was never hit by enemy fire during the whole mission. The second point chosen by the enemy for crossing PL Navajo was far less problematic. A couple minutes before this crossing, a German artillery mission fell on this very spot. The Soviets waited until the fires ceased and then moved onto Hameln. 1st and 4th Platoon "pursuing" the enemy. 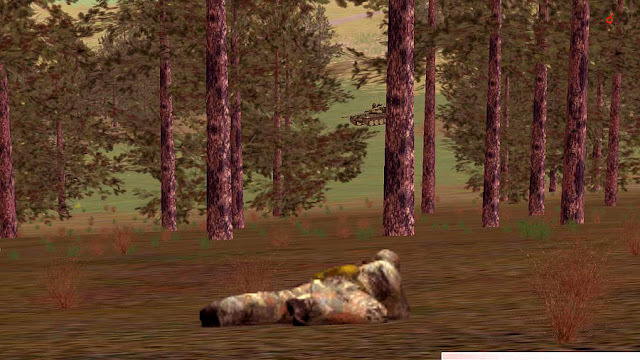 The terrain offered little opportunities for cover, so a great emphasis was made on engaging at maximum range. 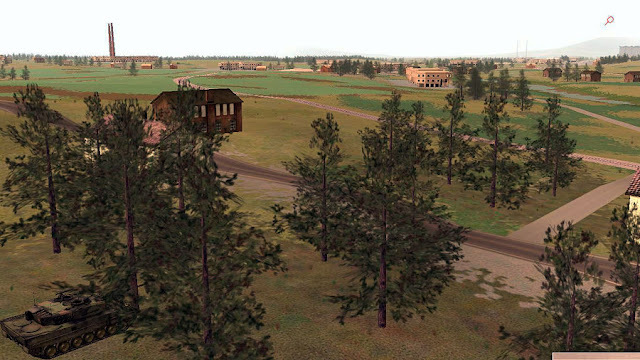 Eventually, having found no enemy tanks in the areas south of PL Navajo, 1st and 4th Platoon moved north towards Hameln. Although the Germans failed to stop the enemy tanks from crossing PL Navajo, the Leopards were committed to mop up the T-72s that were inside Hameln. A Leopard from 1st Platoon destroys a straggler T-72 from a few meters south of PL Navajo. 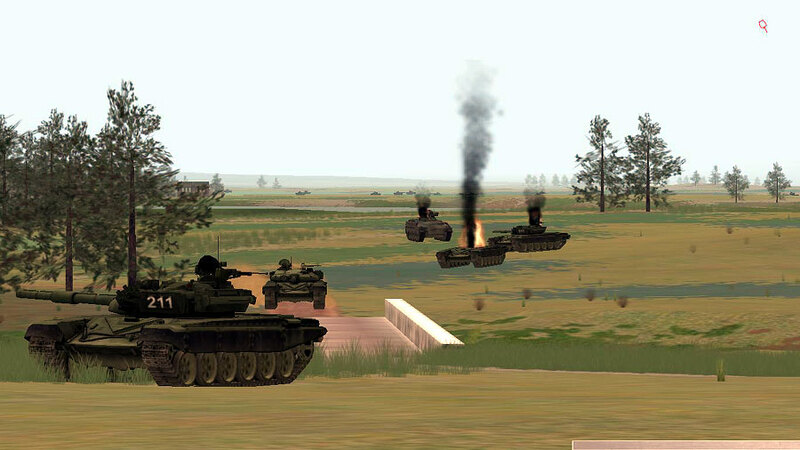 No other targets found near the crossing, the other T-72s have certainly made a thunder run through the city. Tanks from the 4th Platoon moving through the streets of Hameln. And this is where I stopped the mission and called it a day. I suppose that in a real war I wouldn't have the luxury of quitting, but after 1.5 hours of tension and focus my back was sore, my neck was a mess and I was mentally exhausted. This was a though mission and I again thank Koen for it. 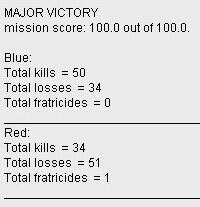 The scenario scoring was a major victory, but I see not many reasons to rejoice in how I commanded my troops. The enemy tanks poured into Hameln. 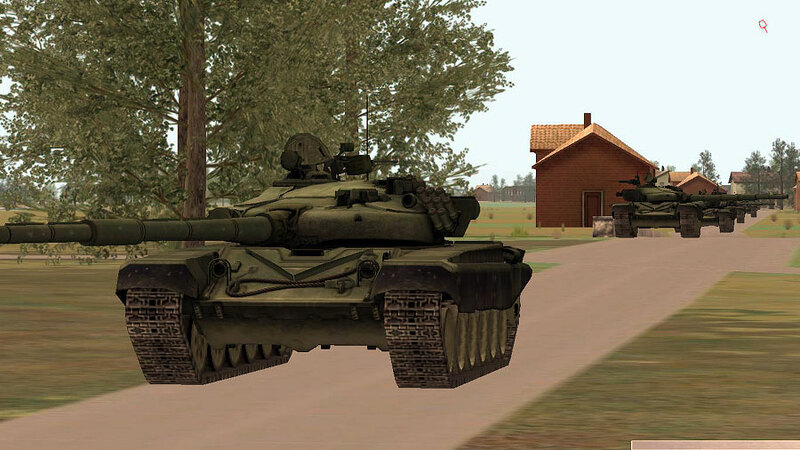 From the AAR replay, I counted 37 T-72s dashing towards PL Navajo. Of these, 32 made it across the canal and into Hameln. Once inside the city, the T-72s suffered serious casualties from the NATO forces there. I had only 5 (out of 13) Leopard tanks left and the enemy was in comfortable possession of crucial terrain (Coppenbrugge, Bisperode and Harderode) and approach routes for a second offensive. Cool stuff! I'm looking forward to this release. Great series you posted, I really enjoyed it. Excellent quote also "It was a mission with a irony written all over it: pursue the enemy not while he retreats, but while he advances ...". was there or will there be an AAR of the North German Plain 85 scenario you've used? As for a NGP 85 AAR, yes. I owe you this one guys.